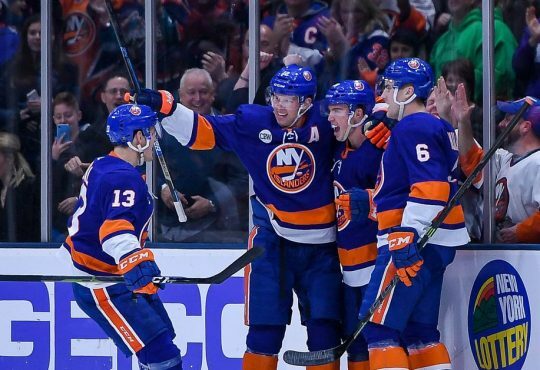 The New York Islanders lost their home opener, 4-3, to the Nashville Predators in front of over 12,000 fans at the Barclays Center in Downtown Brooklyn. The Islanders controlled the puck for most of the game’s first few minutes but Viktor Arvidsson broke off toward the net, made a between-the-legs move to create some space, and finished it off with a quick deke-and-bury to give the Preds a quick 1-0 lead. The Isles set off a barrage of shots during their first power-play of the evening (Craig Smith, interference, 7:19), many of them great looks including Ryan Pulock‘s blast from just shy of the blue line that was kicked back by Juuse Saros‘ right pad, but came up empty on the scoreboard. 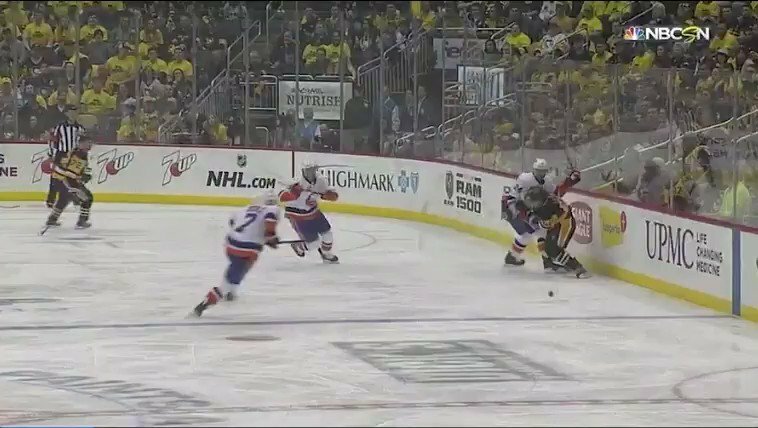 Minutes later, Josh Bailey stole the puck from P.K. Subban behind the Nashville net, threw it out front, and Mathew Barzal appeared to squirt a putback past Saros but the play was whistled dead. 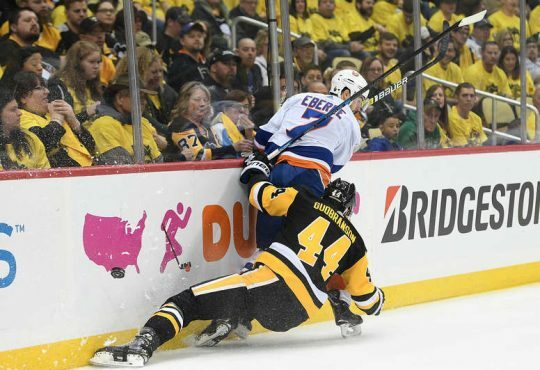 After a not-so-brief review, the referees concluded that the puck did indeed cross the line and the Isles were tied at one. With just over three minutes left in the first, a seemingly all alone Mattias Ekholm blasted a shot from the left point past Thomas Greiss to give Nashville a 2-1 lead. Greiss certainly didn’t look as sharp in the first as he did on Thursday, but he stopped 10-of-12 shots — some in terrific fashion — and kept the Isles in this one early on. Brock Nelson, in search of his 100th career goal in his 400th career game, made a nifty move to advance on Saros just seconds into the second period but was turned away. 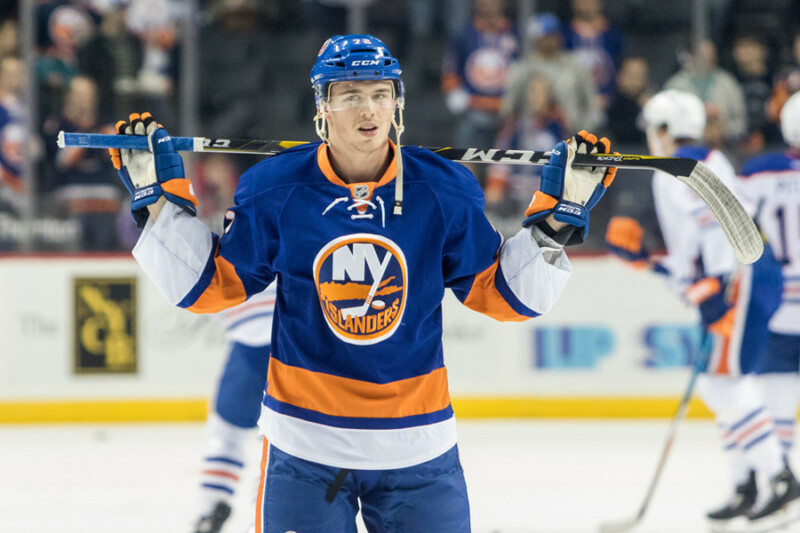 He looks to be trying to make the most of his spot on the Isles’ talented first line. At 17:14 of the period, Tanner Fritz deflected Luca Sbisa‘s wrist shot off of both posts and Valtteri Filppula knocked it home to tie the game at two. Twenty-two seconds after that, the Islanders went on their second man-advantage of the game (Arvidsson, tripping). Anthony Beauvillier had a good look on a Ryan Pulock one-timer but Saros was able to grab and freeze the puck, effectively ending the power-play and definitively coming away with nothing once it did. The Islanders continued to pepper Saros with pucks on net through the second. Their (read: our) new captain, Anders Lee, seemed to be on the ice for a heavy percentage of those assaults. 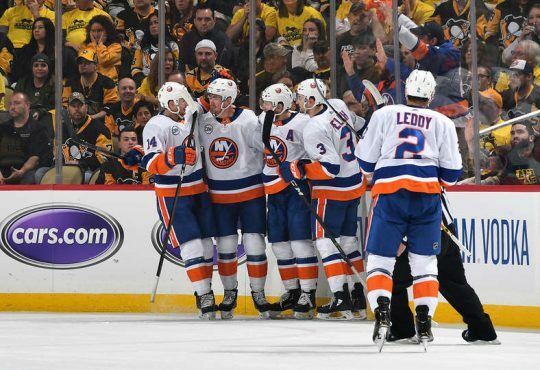 Jordan Eberle showed off his stickhandling skills but couldn’t get the puck past Saros, but that set off a productive shift that saw the Isles spend nearly the next 45 seconds in Nashville’s zone. Craig Smith found a gift under the tree (in front of the net with no one in front of him), snapping a shot past Greiss with 6:30 left in the second to give the Preds a 3-2 lead. Just over three minutes later, Arvidsson squeaked a shot over Greiss’ right shoulder — on a funky angle, to boot — for his second goal of the game, stretching Nashville’s lead to 4-2. With 1:24 left in the second, Zac Rinaldo took down Filppula and put the Islanders on their third power-play of the game. 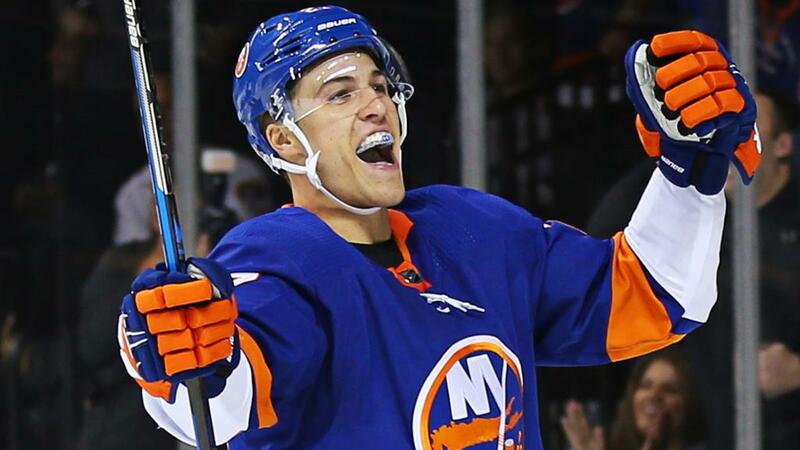 Anders Lee went top-shelf early on but was turned away, then found his own rebound after a Barzal-to-Bailey set up for his first of the year, cutting the Preds’ lead to 4-3. The Islanders put some pressure on Saros and the Predators early on in the third. Pulock shot a rocket off of a faceoff with a little over a minute gone in the period, continuing to show off his fine offensive skills. Leo Komarov took the Isles’ first penalty of the game at 17:39 of the third (holding). The Isles got through the first minute of the man-down situation with physical play and even got a shorthanded shot on goal. With just over 20 seconds left on Nashville’s power-play, Casey Cizikas was taken down by Kyle Turris on an arguable breakaway chance to offset the Isles’ penalty and give the good guys a shot to tie it up with a minute-forty of a man-advantage. Nick Leddy had a clear shot on net from between the circles halfway through the power-play but came up empty, then Pulock put another missile into Saros’ chest before Turris returned to the ice. Missed opportunity. Filip Forsberg and Eberle took matching slashing penalties at 8:16 of the third. Mat Barzal put a powerful shot on net during the 4-on-4 that was turned aside. After a good three minutes of Nashville being consistently in control of the puck, Pulock found Barzal in front of the net with around eight minutes left but Saros made a nice save. 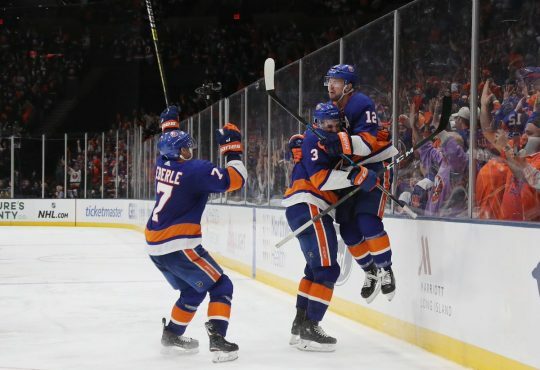 Brock Nelson fed Eberle right in front of the net with around four-and-a-half remaining but, as was the theme of the night, Saros found a way to cut off his angles and keep the Islanders at bay. Bailey, Beau, and Barzy moved the puck well but no one was there when the puck dribbled across the goal mouth with around three minutes left. Greiss headed for the bench a minute later and, between a few icing calls, the Isles had a handful of great chances but just couldn’t solve Saros. After allowing the Hurricanes to put 46 shots on Greiss in the season opener, the Islanders kept their netminder’s workload to a reasonable level (23 shots) in tonight’s loss. Adam Pelech looked better than he did on opening night in Raleigh, breaking up a handful of Nashville advances with well-timed poke-checks. He had a good look on net midway through the second period on a shot from atop the point but couldn’t capitalize on it. Onward and upward, young man. Matt Martin takes no guff. This team missed that wrinkle during his sabbatical in Toronto. Ross Johnston brought shades of it towards the end of last year, but Matty Marts bringing that type of intensity shift after shift is such a compass for the Islanders. Johnny Boychuk looks a step-or-two behind so far this year. Hopefully, that issue corrects itself in short order. He seemed to find his legs for the start of the third period. 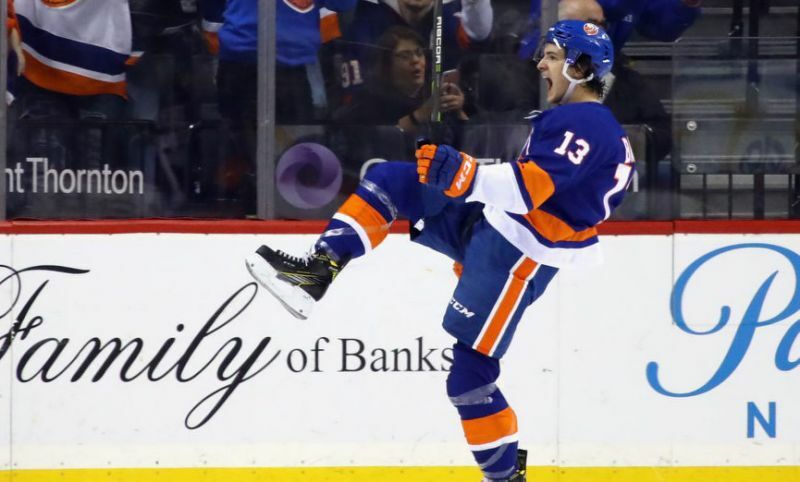 The Isles’ other baby-faced, veteran blue-liner, Nick Leddy, continued his strong play. He’s another one who has a golden opportunity to redeem himself after a publicly-perceived “down year”. Besides an ugly plus/minus (garbage stat for defensemen; don’t @ me), he really had a decent year in ’17-18. The Islanders spent a ton of time in Nashville’s zone, creating chances against a very good team. That’s a good thing, right? There were some glaring missteps made, but, overall, this could be labeled as a benchmark game for this team. The Isles finding their identities as early as possible is imperative. A performance like that against a championship-caliber team is something to be lauded.